This much-reported dispute between Restaurant Daniel and their upstairs neighbors provides a cautionary tale for city residents. 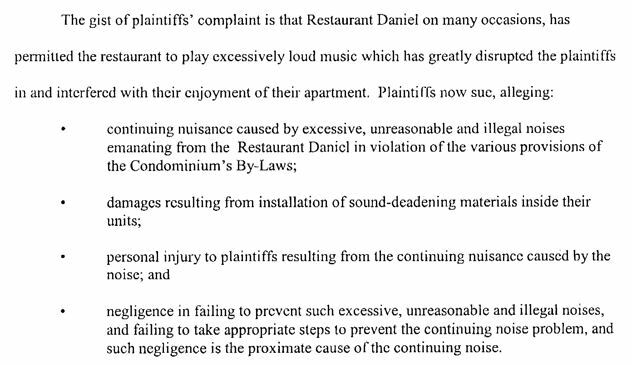 It's a common scenario: Apartment dwellers above a restaurant or nightclub are disturbed by noise and take the issue to court. 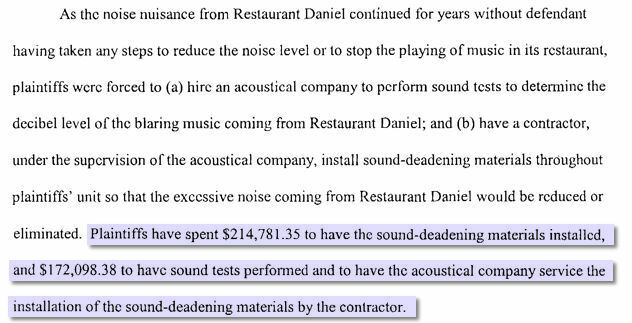 But the judge dismissed this case, finding that the plaintiffs had not shown sufficient evidence to proceed to trial, despite having spent almost $400,000.00 on acoustic testing and materials from another consultant. While we can't know how much sound was actually getting into the apartment, we think that several fundamental mistakes were made. According to the decision, the consultant, Bonnie Schnitta of SoundSense, made noise measurements on New Year's Eve 2005, and not again until the following New Year's Eve. Success in the lawsuit depended on demonstrating that the restaurant was a frequent nuisance. 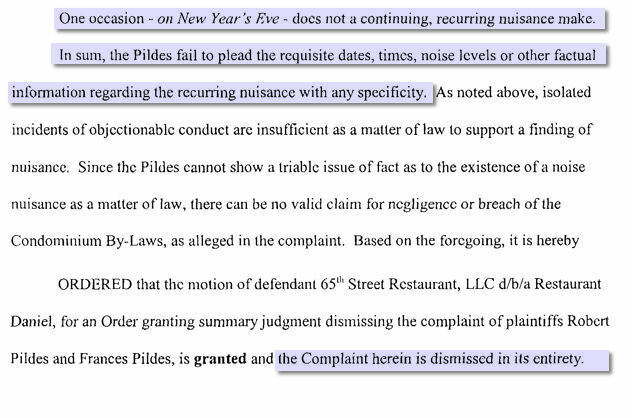 As the judge wrote in her summary judgment "One occasion - on New Year's Eve - does not a continuing, recurring nuisance make." In such cases we have used long-term monitoring and calibrated audio recordings to demonstrate a pattern of noise disturbance. Even if only one measurement was to be made, it should have been taken on a more representative night and the tenants should have been advised to keep detailed notes of the dates and times of other noise disturbances. A second problem was that the consulting company makes and sells materials that they recommend. This dual role, salesperson and consultant, compromises the objectivity of the consultant. Our company, Acoustilog, neither manufactures nor sells any materials. This leaves us free to recommend the most effective, and cost-effective, treatments. In fact, most of our recommendations call for standard building materials.